This has been a busy year in the Learning Studio. Since opening in 2011, we’ve offered workshops to 287 teachers from ACU and other schools and universities. Our records show that 17,278 total reservations were made to the 10 collaboration rooms in the new facility. And we’ve offered hundreds of tours to thousands of visitors interested in the design of the space and our programs. As we wrapped up the spring semester, staff in the Learning Studio began work on our Year One Report, an interactive overview of our first year of operation. The report tells the story of many of the students and faculty we’ve worked with in Year One with examples of projects and testimonials from the participants. As the summer winds down, we hope you’ll take a few minutes to hear a few of the stories and achievements of our students and faculty this first year. 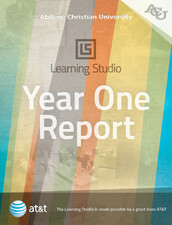 Learning Studio staff produced the Year One Report using iBooks Author for display on iPad, in part to better understand the software and assess its potential in producing next-generation learning content. On September 19th, we’ll be presenting on the process in an NMC Connect webinar hosted by the New Media Consortium. We’ll post more details when we have them to Twitter and Facebook.